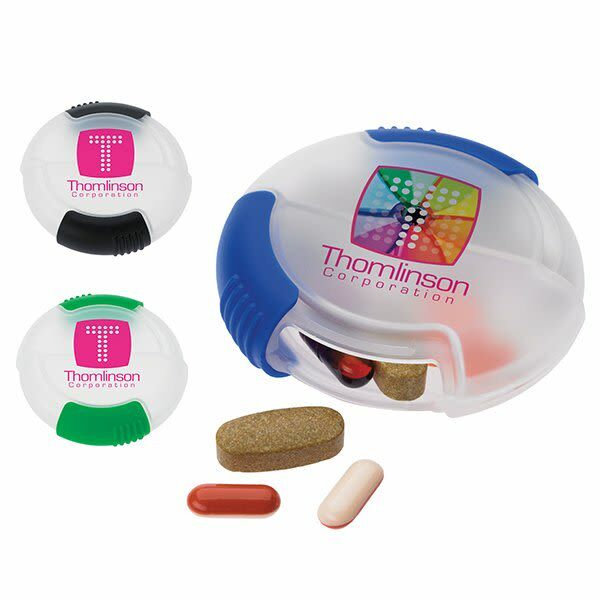 Help your customers keep track of their medication on the go with this portable dual-chambered pill box. Makes an excellent promotional item for pharmacies, hospitals, and assisted living facilities. Great for day to day use to store medication while at the office, or as a substitute for their regular pill box while traveling. The easy open slide feature makes retrieving medication a breeze. Frosted clear with colored sliders. Your price includes a full color britePix imprint on the top of the container for a vibrant, photographic quality imprint. Personalization is available for an added cost. Please call for more information. If you’re looking for the best promotional pill dispensers, you’ve landed in just the right spot. Our Slider wholesale medication dispensers make for some of the best cheap promotional products for hospitals, pharmacies, doctor offices, assisted living facilities, and visiting nurse associations. Standing 2¾ inches high, 2¾ inches wide, and ¾ of an inch thick, these personalized pill dispensers are the perfect size for travel. To operate these custom logo imprinted pill dispensers, all one has to do is slide the moving cover back and collect the pill as it drops out into their hand. The slide is easy to operate, and is available in colors of blue, green, or smoke. Any of these choices provides a pleasing visual contrast when paired with the clear plastic body. Design your own wholesale promotional medication dispensers in style! Each and every one has an imprint area with a 1¾ inch diameter, located on the top of the pill container. Your logo imprint comes in the form of a full color Brite Pix personalized design, which really stands out and pops against a clear plastic surface. Your logo design will be of photographic quality, and you’ll be amazed how it brings this already great promotional healthcare product up to the next level. Want to offer a variety of selections to your customers and target audience? Pair these custom pill dispensers with some of our other custom full-color imprinted pill organizers!